Curious about the music we use to practice? Here is an overview of music for the different styles as well as some playlist suggestions. If you are interested in learning more about ballroom music or have suggestions for us, talk to one of our officers or email us at ballroom@nd.edu. Waltz is a graceful dance known for its rise and fall, its elegance, and its effortless feel. The American style is characterized by its beautiful lines in open moves such as underarm turns. The international style is done completely in closed frame.The music is very expressive, slow to moderately paced, and in 3/4 time. It is counted 1-2-3, 1-2-3. See our Spotify playlist of waltz music. Tango is a passionate and sharp dance characterized by the distinct beat in the music. See for yourself in this Spotify tango playlist . Foxtrot is a dance characterized by an almost aristocratic mood. It is danced to music with jazzy themes in 4/4 time. 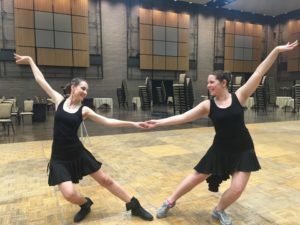 This Spotify foxtrot playlist will give you an idea of what kind of music foxtrot is danced to. Viennese waltz is a fast, light, and elegant dance. It is danced in 3/4 time like Waltz, but significantly faster. Here is a Spotify Viennese waltz playlist with our most beloved practice songs. We dance cha cha in two different styles: American rhythm and international latin. 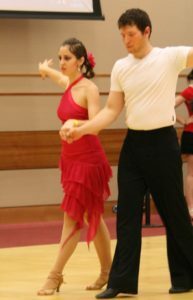 Although the technique and moves are often different, the two styles are united by same sassy music type and atmosphere. Here is a Spotify cha cha playlist with some of our favorite cha cha beats. Just like cha cha, we dance rumba in both American rhythm and international latin styles. Passionate rumba is characterized by the slow-quick-quick beat. This Spotify rumba playlist helps us find the necessary mood. East Coast swing is an American rhythm dance while jive is an international latin dance inspired by swing culture. 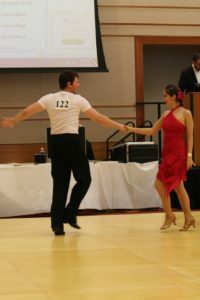 Despite the differences in the two dances they are danced to music with a similar beat; however, jive is more often than not faster than swing. This Spotify swing and jive playlist is a combination of our favorite swing and jive hits. American mambo is an American rhythm dance inspired by the Caribbean salsa culture. It is danced to fast Latin music with a characteristic beat similarly inspired by salsa music. Our Spotify mambo playlist is a combination of popular mambo and salsa beats. Samba is a fiery international latin style dance. It’s one of the fastest dances in our repertoire and is danced music with a unique beat. This Spotify samba playlist is a collection of songs we use for practice.